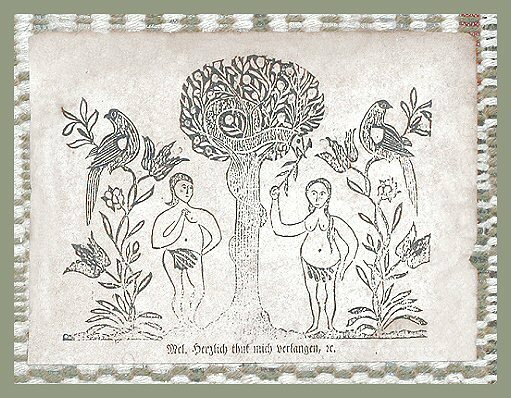 Above: A woodcut Adam and Eve ...cut and printed by Peter Montelius circa 1815. Peter Montelius was a wandering Lutheran school teacher / printer / church organist. He wandered across our Pennsylvania Dutch counties, wherever his employment led him. Peter taught school in Lancaster, Northumberland, and Union Counties. His Lutheran parents had settled here in Reamstown, Lancster County, after emigrating here from Germany. Peter is well-known today for the fraktur certificates he printed in Reamstown for his Pennsylvania Dutch neighbors. Certificates to document their passage through life: certificates to record their births and baptisms, to celebrate their marriages, and to mourn their deaths. Peter's sons Timothy and Marcus also became printers. Above: Peter Montelius borrowed his Garden-of-Eden bird design from the Ephrata printers John and Samuel Bauman who first printed these birds on their own broadsides and certificates. John Bauman first began printing his Bauman bird circa 1808. Looks like everyone liked (and borrowed) those Bauman birds. The David Frey Bird: David Frey (born 1759 - died 1841) was a Moravian fraktur artist who taught school in northern Lancaster County. He painted his Bauman bird in 1818 for a student named Samuel Hershey (born 1810 - died 1893). Samuel grew up to become a Mennonite preacher. The Isaac Palm Bird: Isaac Palm is Here. The John Landis Bird: John A. Landis painted his Bauman bird in 1852, in a painting that he created at age 75. John Landis is known today for his "Landis Museum", a museum of curiosities that was located on North Queen Street. That museum appears in a print Here.